Bushfire Mitigation NOJA Power OSM Recloser in Queensland, Australia. Throughout Australia, NOJA Power’s OSM Recloser has become the trusted name in bushfire mitigation technology. 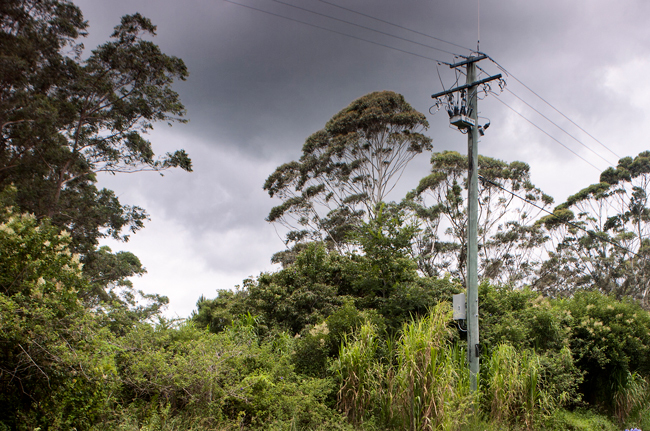 Collaboration between the Brisbane based manufacturer and Australian utilities has culminated in a suite of protection and automation functionality deployed to resolve the challenges of Australia’s catastrophic bushfire season. After the 2009 Victorian Bushfire Disaster, thousands of NOJA Power Reclosers have been deployed to solve and mitigate bushfire risk. Nine years later and the system is achieving its goal. Driven by the findings of the Royal Commission into the 2009 Victorian Bushfire disaster in Australia, NOJA Power has developed a suite of functionality to address the recommendations of the report. Any form of Reclosing is not the solution to Wildfire or Bushfire Mitigation. Reclosers must be used in single shot mode on fire risk days. Reclosing is an important, but small part of an overall bushfire mitigation strategy. Utilities need to consider fault detection techniques to detect high impedance faults in the first place. NOJA Power has worked diligently together with Australian utilities to provide a suite of functionality in the OSM Recloser to provide the tools necessary to detect fire-starting scenarios. Whilst the deployment of NOJA Power Reclosers throughout Australia has been successful in mitigating fire risks across the country, it is imperative that the entire system be considered. For all the protection functionality in the device, an absolute necessity is Arc Fault Control and Venting. In the substation, any switchgear must consider the ramifications of the outcomes of an Arc Flash scenario. A 30-year life for any piece of switchgear is a good benchmark – but it is essential to consider what occurs in an arc flash event. When it comes to bushfire mitigation, development of protection functionality such as the OSM Recloser’s High Resolution SEF, Harmonics Protection, ANSI 46 BC Broken Conductor and Admittance Protection are only part of the solution – the reality is that this functionality is contained in the world’s only solid dielectric, Arc Fault Controlled and Vented recloser. If there is a catastrophic lightning strike, surge, or physical harm to the Recloser – the device will act safely and comply to the Arc Fault Test Standard. Not only does this rugged enclosure provide containment and controlled venting for arc faults, it protects the Solid Dielectric Insulation from the harsh Australian sun. Solid Dielectric insulation reliability is achieved by shielding the insulators from solar radiation, and the NOJA Power OSM Recloser provides peace of mind in this environment. With over 15 years of proven service in the worst that Australia’s climate has to offer, the OSM Recloser is Australia’s number one choice in bushfire mitigation.